Position rack in the center of oven, preheat to 350°. Line muffin tin with foil liners or butter the pans. 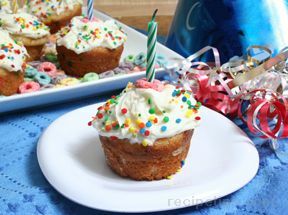 CUPCAKES: Combine the cake mix, water, eggs, oil, sour cream, vanilla, and kosher salt in the bowl of a stand mixer fitted with the paddle attachment. Alternatively, use an electric hand mixer. Beat on low speed until the mixture is well blended. Increase the speed to medium if using a stand mixer (high for a hand mixer) and beat for 2 minutes. Stir in chocolate chips. 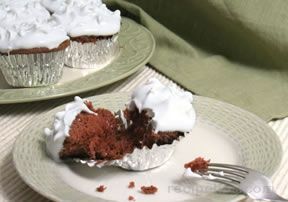 Pour the batter into the prepared cupcake tin and bake until a knife inserted into the center of a cupcake comes out clean, about 20 minutes. Transfer to a wire rack to let cool for 10-15 minutes. Remove the cupcakes from pan and let them cool completely. ICING: Put the chocolate chips in the metal bowl of a stand mixer fitted with the whisk attachment. Alternately, use an electric hand mixer. Combine the sugar, milk, butter, and kosher salt in a small saucepan over high heat and bring to a boil, stirring occasionally. Let boil vigorously for exactly 1 minute. Pour the hot sugar mixture over the chocolate. Add the vanilla. Beat at medium speed until the mixture begins to thicken to spreadable consistency, about 10 minutes. 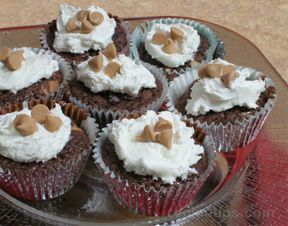 Top cupcakes with icing. Enjoy!